Representation of a kernel-density estimate using Gaussian kernels. 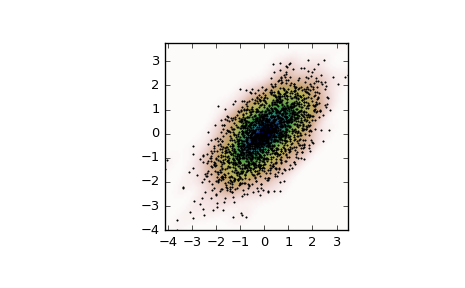 Kernel density estimation is a way to estimate the probability density function (PDF) of a random variable in a non-parametric way. gaussian_kde works for both uni-variate and multi-variate data. It includes automatic bandwidth determination. The estimation works best for a unimodal distribution; bimodal or multi-modal distributions tend to be oversmoothed. Datapoints to estimate from. In case of univariate data this is a 1-D array, otherwise a 2-D array with shape (# of dims, # of data). The method used to calculate the estimator bandwidth. This can be ‘scott’, ‘silverman’, a scalar constant or a callable. If a scalar, this will be used directly as kde.factor. If a callable, it should take a gaussian_kde instance as only parameter and return a scalar. If None (default), ‘scott’ is used. See Notes for more details. Bandwidth selection strongly influences the estimate obtained from the KDE (much more so than the actual shape of the kernel). Bandwidth selection can be done by a “rule of thumb”, by cross-validation, by “plug-in methods” or by other means; see [R523], [R524] for reviews. gaussian_kde uses a rule of thumb, the default is Scott’s Rule. (n * (d + 2) / 4.)**(-1. / (d + 4)). Good general descriptions of kernel density estimation can be found in [R521] and [R522], the mathematics for this multi-dimensional implementation can be found in [R521]. [R521] (1, 2, 3, 4) D.W. Scott, “Multivariate Density Estimation: Theory, Practice, and Visualization”, John Wiley & Sons, New York, Chicester, 1992. [R522] (1, 2, 3) B.W. Silverman, “Density Estimation for Statistics and Data Analysis”, Vol. 26, Monographs on Statistics and Applied Probability, Chapman and Hall, London, 1986. [R523] (1, 2) B.A. Turlach, “Bandwidth Selection in Kernel Density Estimation: A Review”, CORE and Institut de Statistique, Vol. 19, pp. 1-33, 1993. [R524] (1, 2) D.M. Bashtannyk and R.J. Hyndman, “Bandwidth selection for kernel conditional density estimation”, Computational Statistics & Data Analysis, Vol. 36, pp. 279-298, 2001. ...     "Measurement model, return two coupled measurements." dataset (ndarray) The dataset with which gaussian_kde was initialized. d (int) Number of dimensions. n (int) Number of datapoints. factor (float) The bandwidth factor, obtained from kde.covariance_factor, with which the covariance matrix is multiplied. covariance (ndarray) The covariance matrix of dataset, scaled by the calculated bandwidth (kde.factor). inv_cov (ndarray) The inverse of covariance. evaluate(points) Evaluate the estimated pdf on a set of points. __call__(points) Evaluate the estimated pdf on a set of points. integrate_gaussian(mean, cov) Multiply estimated density by a multivariate Gaussian and integrate over the whole space. integrate_box_1d(low, high) Computes the integral of a 1D pdf between two bounds. integrate_box(low_bounds, high_bounds[, maxpts]) Computes the integral of a pdf over a rectangular interval. integrate_kde(other) Computes the integral of the product of this kernel density estimate with another. pdf(x) Evaluate the estimated pdf on a provided set of points. logpdf(x) Evaluate the log of the estimated pdf on a provided set of points. resample([size]) Randomly sample a dataset from the estimated pdf. set_bandwidth([bw_method]) Compute the estimator bandwidth with given method. covariance_factor() Computes the coefficient (kde.factor) that multiplies the data covariance matrix to obtain the kernel covariance matrix.